Hospital rooms, shopping floors, and fast-food counters: This is where the future of U.S. employment lives. We think. 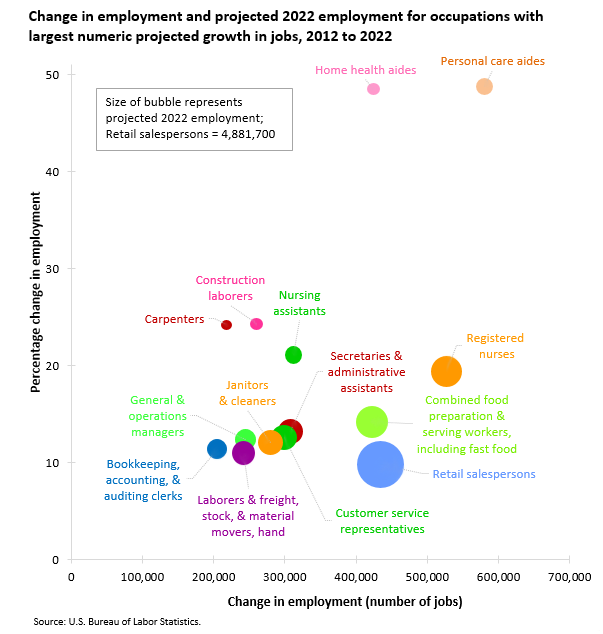 The latest ten-year projection from the Bureau of Labor Statistics finds that just a handful of occupations—personal care aides, registered nurses, nursing assistants, and home health aides (all in health care), along with retail salespeople and food-prep workers—will account for one-in-six new jobs in the next decade. But there are two catches. Here's the first. Healthcare spending is growing slower than the economy for the first time since 1997, and "nobody knows why," as Matt O'Brien reported for The Atlantic. And the slowdown in growth is affecting workers, too. Healthcare jobs apparently fell in December for the first time in at least 27 years. Fresh out of the oven, BLS's healthcare employment projections might already be deflating. These ten occupations account for 3.85 million projected jobs in the next ten years, or 25 percent of the decade's projected job haul. And six of them are at least two-thirds automatable, based on researchers' projections of current computing power. For example, secretaries and administrative assistants are already being complemented or replaced by simple office organization software, and Walmart and Amazon pose a mortal threat to many classic retail jobs, even before you account for Kiva robots patrolling warehouse floors around the country. To be fair, this is an article about the future, which, as a rule, is unknowable. Ten years ago, the BLS whiffed on its ten-year projections by 13 million jobs, since it failed to predict the mining boom, the publishing apocalypse, and the Great Recession. In all likelihood, the BLS will whiff again this decade (such is the nature of huge predictions), but perhaps it will be a Great Automation rather than a Great Recession that causes the miss.